Water quality in the Great Swamp Watershed region generally is rated excellent or good for temperature, dissolved oxygen and pH, but some areas show problems with bacteria, nitrogen and phosphorus levels, according to a report card issued by the Great Swamp Watershed Association. In a presentation July 17 at the Madison Public Library, Sandra LaVigne, the association’s director of water quality programs, said recent warm winters have meant that less road salt is being used, which benefits water quality. But the warm weather increases the growth of plants and algae in waterways and means that heavy rains in late spring and summer wash sediment from the dry ground, along with contaminants, into streams, she said. The GSWA increased its sampling in the Passaic River headwaters region in 2017, LaVigne said. The river’s headwaters begin in downtown Mendham Borough and Mendham Township. 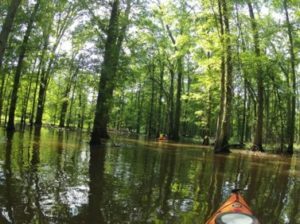 “Data indicate that this stream continues to be one of the healthiest in the Great Swamp Watershed,” according to the report, which showed good or excellent ratings in all categories. 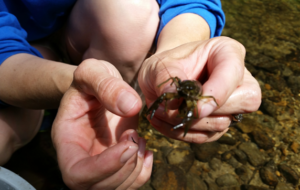 However, water temperatures in the upstream sampling location were affected by warmer-than-average air temperatures which may have led to decreased diversity of macroinvertebrates, which are small animals without backbones, such as crayfish, worms and insect larvae. Nitrogen le vels also rose in the upper region of the headwaters sub-watershed, which may be the result of organic matter, such as leaves, being carried into streams, the report said. Primrose Brook, which begins in and near the Jockey Hollow section of the Morristown National Historical Park, then flows into the Great Swamp in Harding Township, is considered the healthiest stream in the Great Swamp Watershed and “continues to be an excellent example of a pristine stream habitat,” according to the report. It was rated excellent for dissolved oxygen, water temperature, pH, road salt, water clarity and nitrogen level and good for macroinvertebrates as well as visual stream assessment. Primrose’s only poor grade was for bacteria level. Dissolved oxygen helps fish and other forms of life survive in the water while too much salt can kill them; pH measures acidity. The Great Brook sub-watershed, which originates in Morris Township, was rated excellent for dissolved oxygen, water temperature and pH and good for road salt, water clarity, macroinvertebrates, visual stream assessment and phosphorus level. It received a poor rating for nitrogen level and very poor for bacteria level, which rose in 2017 from a year earlier. 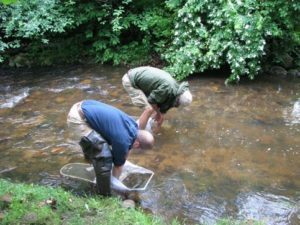 “Great Brook continues to fall in the middle range of our water quality, with some improvements seen in dissolved oxygen and road-salt concentrations. The macroinvertebrate population continues to improve for the second year with a significant increase in diversity,” the report said. The watershed association has been working with Morris Township to try to identify the source of increased bacteria levels in Silver Brook, a Great Brook tributary that originates in the township, then flows through Harding, LaVigne said. The Loantaka Brook sub-watershed, which originates in Morristown and Morris Township and continues through Green Village into the Great Swamp National Wildlife Refuge, was rated excellent for dissolved oxygen, water temperature and pH and good for water clarity and visual stream assessment. It had poor ratings for road salt, macroinvertebrates and phosphorus level and very poor for nitrogen and bacteria levels. The bacteria levels, similar to those measured in 2016, may be attributed to the waterfowl regularly seen on Kitchell Pond in the Loantaka Brook Reservation in Morris Township and to the pets walked by many residents in that large park, the report said. But phosphorus levels have fallen steadily since 2015, possibly because native plants, shrubs and trees have been added, increasing the buffer area around the pond and reducing the impact of runoff from the park and nearby sports fields, according to the report. LaVigne said municipalities can help improve water quality by finding alternatives to road salt. For example, some use brine to coat roads before a snowstorm to reduce the need for salt. Preserving open space and planting vegetation along waterways to provide shade also helps preserve water quality, she said. Homeowners can help by breaking up their lawns by planting native shrubs and flowers. LaVigne explained that a large uninterrupted closely mowed grass lawn is similar to pavement because stormwater rolls off it, picking up contaminants and carrying them into streams, rather than sinking into the ground. Residents also can help preserve water quality by picking up after their dogs, maintaining their septic systems, and reducing the amount of salt they put on sidewalks and driveways during the winter.